PolyDyne Pro – Utilizing the newest science in surface treatment and electronic technology, PolyDyne Pro is designed for intelligent, consistent, and powerful corona treatment. 3DT’s new, versatile, high-performance corona treatment system improves the surface tension on numerous materials resistant to printing, adhesive, and coating processes. PolyDyne Pro is engineered with multiple feedback devices for precise performance monitoring and adapts to many types of applications, such as 3-dimensional plastic parts, medical parts, plastic sheets, foam, corrugated material, and more. To learn more about PolyDyne Pro contact one of our sales engineers at 1-262-253-6700, sales@3DTLLC.com or visit our website at www.3DTLLC.com. PLASMADYNE 3DT LLC has updated its PlasmaDyne atmosphereic plasma surface treating system, which is used on injection molded, blow molded and extruded parts. It uses thermal atmospheric plasma, which is a highly ionized air stream, to microclean surfaces and to create improved molecular properties for bonding and printin g. Atmospheric plasma treating alters the surface energy of the plastic, resulting in powerful bonding with adhesioives, coatings, flocking, paint and ink, without the need for toxic solvents. It is available with one or two heads; more heads are available as a custom option. WHAT’S NEW? Numerous upgrades, including an updated controller and output power stage that allow independent control of multiple plasma treatment heads. A liquid-crystal display provides system feedback, local, or remote control, expanded input/output capabilities and a programmable timer. The single unit is light making it easy to move and integrate into production lines. BENEFITS Safe, economical and effective surface treatment and the flexibility to change from one application to the next. FlexiDyne Pro now includes a redesigned corona generator that produces a more powerful corona discharge allowing for the treatment of larger part sizes, increased variety in substrates treated, faster line speed, and better adhesion of media. The FlexiDyne Pro corona treating system from 3DT treats 3-D parts with powerful corona treatment causing highly improved surface energy on a wide variety of plastics and parts. This improved surface energy causes inks, adhesives and coatings to bond with the substrate and even greatly improves cell growth in labware. FlexiDyne has been an important system in 3DT’s product line for years, but in winter 2018 the electrical and mechanical design was updated to produce a larger corona field and thereby attain higher treatment levels and the successful treatment of larger parts. FlexiDyne Pro is ideal for items such as Petri dishes, test panels, multi-well plates, lenses and many other 3-D parts. Now, the treatment of wider parts such as large container lids, mirror housings and the largest labware (such as flasks) is possible. Conveniently, FlexiDyne Pro does not require set-up changes for parts of different sizes and shapes. FlexiDyne Pro has undergone a full electrical redesign of its corona generator providing more power and at adjustable levels. Mechanical adjustments were made to accommodate wider parts entering and guided through the treating station. FlexiDyne Pro’s improved treatment capabilities create higher surface energy for printing, marking and adhesive applications as well as better cell culture growth on labware. These new levels in surface treatment ensure highly consistent, reliable adhesion, and faster “thru-put” or production. FlexiDyne Pro’s new advantages includes higher powered corona discharge and at adjustable levels. This allows for greater flexibility in the types of substrates used. For example, the quality of delicate materials may be preserved using less power, while more resistant and sturdy materials can receive full power; up to 2 kilowatts. These upgrades also produce higher surface energy levels than before. Our engineers have measured higher dyne levels after treatment and witness better bonding between substrates and media. What’s more, the new generator’s power advantage allows for the treatment of taller and wider 3D parts due to a larger corona field. Previously, FlexiDyne was limited to small, flat parts. Now FlexiDyne Pro can treat parts that are 1.5″ in height and appoximately 12″ in width. Germantown, WI 3DT LLC, true pioneers in plasma and corona treatment, celebrates their 25th Anniversary August 1. In 1991 electrical surface treatment was an emerging technology in the United States. Two young Danish businessmen, Morten Jorgensen and Erik Kiel, brought corona and plasma technology from Denmark where it was invented by engineer, Verner Eisby in the 1950s and later adapted to the treatment of 3D parts by Bent Sorensen in the 1970s. In the 1990s most automotive, medical and packaging manufacturers were using chemical primer baths, physical abrasion and flame treatment to increase the surface tension and bonding on 3D parts. The drawbacks of these methods were huge, including being environmentally and health hazardous and costly. As a result, the new, safe, quick and less labor-intensive corona treatment took off, particularly with 3DT’s reliable and highly effective equipment. Today, 3DT produces a complete line of surface treatment systems developed to manage adhesion problems on nearly all substrates and configuration of parts. 3DT covers the spectrum in surface treatment solutions from microcleaning Petri dishes for cell growth to improving the adhesion of flocking on rubber profiles. Their systems range from compact tabletop units to mammoth 10 treating head systems. 3DT’s worldwide success for 25 years lies in their innovative technology, robust design, reliable results and exceptional customer service provided with every standard and custom system. Completing their line of solutions, 3DT represents two German companies for North America: SOFTAL and AFS. Both firms are powerhouses in the film manufacturing and converting industries. Whether an application is 10 inches or 10 meters, there is a surface treatment solution at 3DT. Currently, 3DT is experiencing favorable growth in this area of the market due to high quality German engineering and 3DT’s local, expert sales and service. With the goal of developing and serving the European market better, 3DT LLC of Germantown, Wisconsin and SICATECH of Linde, Denmark have formed a partnership. Effective November 1, SICATECH will oversee sales, service, and support for 3DT in Europe. This partnership unites two pivotal companies in the surface treatment and pad printing industries. It puts “feet on the ground” in Europe for 3DT, bringing many benefits to their customers and agents. These benefits include, European service and support, more and highly knowledgeable sales personnel, reduced shipping time for standard systems and spare parts, and compatible business hours. Additionally, the combined industry knowledge and experience of 3DT and SICATECH will work to overcome adhesion challenges by providing solutions that stick. 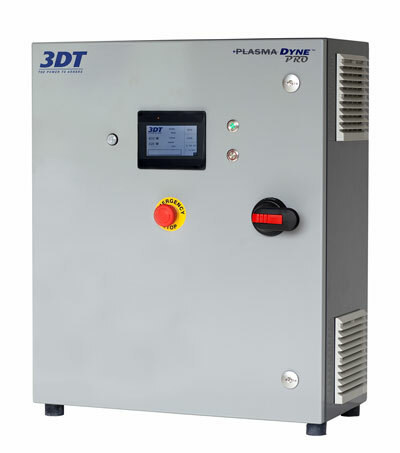 This article in Plastics Decorating ENews discusses the science of atmospheric plasma, and the advantages of 3DT’s new, variable plasma discharge control. Does it sound contradictory that suppliers of surface treatment technology say a technology is spreading steadily into new markets and applications, yet many manufacturing engineers don’t think of it at all? Suppliers say that’s the case. Though it can be an advantage when nothing sticks to a plastic product, it’s a big problem when something should. Surface treatment, broadly defined, is the modification of a surface to achieve good adhesion between it and something applied or bonded to it. It is useful for plastics because they generally have inherently low surface energy. Adhesives, coatings, ink, labels and paint can’t find enough to hang onto. Treatment increases the surface’s energy and wettability, enabling it to form a strong bond with what is being applied. Why then do many engineers facing an adhesion problem — for example, fully dry ink is wiping right off — not look into surface treatment? Treatment system suppliers say engineers usually look first at what’s close: polymer materials, additives, printing technology, process parameters and, of course, the ink. Suppliers also say that, as awareness and understanding of surface treatment spread, processors are turning to it sooner. Let’s look at surface treatment technology itself. It’s interesting and worth knowing. Greg Wood, president of surface treatment technology supplier Lectro Engineering Co. Inc., St. Louis, says efforts to improve surface treatment for plastics have been ongoing since the early days of plastics. Much research has been done, yet the understanding of how surface treatment improves adhesion was limited because treatment processes might affect only the upper few hundred angstroms of a plastic surface. Being only one-hundred-millionth of a centimeter long, angstroms are mainly used to express wavelengths and interatomic distances. A few hundred are very nearly nothing, and not much to work with. Relatively recent technology finally enabled analysis at the nano level and two theories now explain why surface treatment works. The functional group theory says treatment causes surface reactions such as oxidation, the scission of polymer chains and cross-linking, which create functional groups including carbonyl, carboxyl, hydroperoxide and hydroxyl that enhance chemical bonding to the plastic surface. The mechanical-physical theory suggests a molecular-level pitting and cracking of the surface, which allow a mechanical bonding between the plastics surface and what is applied. The two theories don’t apply to all treatment approaches, but might both be at play with plasma. Chemical and mechanical surface treatment may seem fairly low-tech, but they are still in use. Chemical treatment, mostly with chlorinated solvents or strong acids or bases, attacks the surface, breaking bonds and creating free radicals that roughen the surface. Wiping a chlorinated solution on a plastic surface before bonding or painting is still widely used in the process of painting plastic auto parts, but is giving way to other treatment methods as safety and environmental rules grow more stringent. Mechanical abrasion of a plastic surface can help adhesion and is most often done with another surface treatment to improve adhesion. The potential drawbacks of chemical treatment and mechanical abrasion should be obvious. Flame treatment is probably the most familiar surface treatment, using an oxidizing flame of 2,000 degrees Fahrenheit to 5,000 degrees Fahrenheit contacts the plastic surface. Generally, the hotter the flame, the faster and more effective the treatment. Balancing that is the need to minimize the flame’s exposure to the plastic to avoid distortion, warping and dulling of gloss finishes. In its favor, flame will vaporize some contaminants and is fast. However, it generally doesn’t work on irregularly shaped parts, and it presents obvious safety issues in a manufacturing plant. The treatment requires a relatively high amount of energy. Combustion’s high temperatures create plasma; however, in industrial uses, plasma is applied through lower-heat techniques that rely on the ionization of gases. Unlike other treatments, plasma performs three services at once: It activates the surface by selective oxidation to ensure stronger adhesion of paint, ink, labels, coatings or virtually anything else; it eliminates static charge; and it performs micro-cleaning. Corona treatment, which has been long used for film and other flat plastic substrates, directs a high-frequency corona discharge through a small air gap at the surface to be treated. On the upside, corona treatment eliminates shrinking and warping and is safer than an open flame. One drawback is that the discharge-emitting electrode has to be close to the part. Multiple electrodes are needed for different parts and more setup time is needed. Gas plasma treatment is done within a low-pressure chamber. Plasma is formed from a gas such as helium, argon, oxygen or nitrogen, using radio or microwave frequencies. It increases surface energy greatly, works with irregularly shaped parts and allows creation of specific functional groups on the plastic surface. Because it is a batch method and has high equipment costs, gas plasma treatment is mostly used with high-value products such as those in the medical sector. Significantly, since only air and electrical power are needed for plasma surface treatment, and it creates no effluent or volatile organic compounds, it can be integrated easily into existing production processes via conveyors, robotics and other methods. In addition to cleaning, activating and eliminating static on plastic products, atmospheric plasma also works on aluminum and other metals, glass, recycled materials and composites. Germantown, WI – Advances in minimally invasive surgery get a boost from 3DT’s surface treatment system, TubeDyne Treating System. This system is designed to treat medical tube ends for a permanent bond to surgical instruments, housings or other tubing such as catheters. TubeDyne harnesses atmospheric plasma which alters the surface energy on pebax and polyethylene tubing creating a strong bond with adhesives, coatings, and ink. 3DT’s TubeDyne uniformly and gently treats tubing within its self-contained, compact, tabletop unit. TubeDyne is designed for the outside treatment of tube ends. Any tubing up to 0.375″ in diameter, with or without metal inserts, can be placed in the holding fixture and receive uniform treatment at a length of approximately 2.00″. The unit includes an integrated generator, transformer, electrode assembly, holding fixture and ozone filter. TubeDyne is PLC-controlled and features an operator console with a human machine interface (HMI), including: a programmable, monochrome touch screen with status menu, run time log, service hour log and alarm/trouble-shooting screen. It is operator safe, friendly, and ergonomically designed. TubeDyne offers consistent, uniform, 360 degree treatment resulting in powerful bonding. 3DT LLC, is a leader in plasma and corona treating, offering a broad line of standard systems as well as custom systems. With 25 years of experience, 3DT provides solutions to adhesion problems with systems capable of treating virtually any 3-dimensional or 2-dimensional surface, regardless of shape, with superior adhesion results. For more information contact sales@3DTLLC.com or visit the website at www.3DTLLC.com. 3DT LLC, surface treatment specialists of Germantown, Wisconsin, has unveiled their latest atmospheric plasma treating system designed especially for the treatment of glue lines on cartons. This super-sized PlasmaDyne system is designed to accommodate the components of four plasma treating heads. Atmospheric plasma (a highly-ionized air stream) re-structures the chemical properties of many surfaces creating conditions for a secure bonding of glue lines to cardboard cartons. PlasmaDyne technology is gentle enough for paper. The PlasmaDyne system easily integrates into folding production lines and includes precise, adjustable handling brackets. Each treating head is programmed to operate independently providing flexibility for numerous carton applications. PlasmaDyne is available with 1 – 4 heads, depending on the number of glue lines required. This model is just one of several plasma systems from 3DT designed to deliver highly effective surface treatment for both conductive and non-conductive applications. PlasmaDyne meets numerous surface treatment needs such as improving the adhesion of coatings, laminates, paint, ink, glue, and the cleaning of many types of substrates. For more information, visit www.3DTLLC.com. Corona stations are available in all sizes depending on the application- from 10 inch narrow web lines to wide coating machines and BOPP/BOPET lines of up to 10 meters. Usually, the high frequency high voltage that is needed to power the corona process is provided by generators that have to be upsized with increasing performance requirements. However, their maximum performance is limited due to the maximum available size of the electrical components in the power inverters. With the maximum performance available on the market – 60kW per generator – and therefore per electrode bar, the limits of the technical possibilities are reached. Not only on extremely wide lines but also at high speed applications or for materials with high demands in terms of corona dosage. Scaling for pretreatment by means of additional electrodes and a single generator quickly becomes expensive due to larger or additional rollers. A further disadvantage of these large single generators is that a technical defect at a critical part of the inverter can bring an entire web to a standstill. AFS, from Horgau, Germany, now offers a modular generator design as a solid solution to both problems. AFS’ modular generator overcomes the performance limitations of a single generator and, at the same time, minimizes failure rate. These generators boast several parallel power inverters, which increase the maximum performance of a single generator to 144kW – more than twice as much as conventional products on the market. Consequently, modular generators are capable of setting new performance records and are perfectly suited for the power needed for processes with controlled gas, such as plasma treatment systems. If a module fails, the generator will still operate but with a reduction in power until the module is replaced by a new one – simply “plug and play.” Single modules are identical and thus interchangeable. Clearly, modular generators reduce production line downtime and costly trips by onsite service specialists. During the development of their modular generator technology, the experts at AFS included the most sophisticated components available, such as a larger TFT color touch screens which employ an intuitive user-interface on the generator similar to the graphics and functions of smartphones and tablets. Operational settings can now be adjusted through the proven rotary knob as well as by means of a touch screen. Additionally, system parameters can be easily adjusted through a password protected area for specific applications. For more information about the AFS modular generator and their full line of corona and plasma treating systems contact 3DT LLC, North America’s representative for AFS, at Sales@3DTLLC.com or visit their website at www.3DTLLC.com. This article appeared in the April/May 2018 edition of Plastics Decorating magazine and is written by Scott Sabreen, President of the Sabreen Group. It features information developed through a strong relationship with 3DT. Producing a complete line of surface treatment systems designed to address common adhesion issues that occur in several industries, 3DT LLC, Germantown, Wisconsin, recently released an updated version of PlasmaDyne, called PlasmaDyne Pro. “We updated it as part of the company’s effort toward continual technological improvement and meeting the needs of the industry,” explained Alex Kiel, electrical engineer at 3DT. The updates include the newest in electrical engineering, components and design. The newer system features an optimized control panel, adjustable plasma treatment levels, energy efficiency and modular replacement parts, and it is compact and economical. “Several features of the PlasmaDyne Pro will benefit users,” Kiel said. The power level is adjustable up to 600W to achieve desired treatment levels. “The power can be turned up to raise surface energy on resistant substrates, and it can be lowered for delicate substrates,” he continued. “Treatment levels can be programmed for each individual treating head.” Another feature is the color touch display for monitoring all system parameters, including troubleshooting and fault log. The modular power supply for treating heads allows for quick, easy changes to keep production running. PlasmaDyne Pro is compact and economical: The systems with three or more treating heads are smaller than systems previously produced and more economical, as a result. PlasmaDyne Pro utilizes atmospheric plasma technology to uniformly treat surfaces for the improved adhesion of glue, paint, ink, flocking, coatings and laminates. It produces plasma from a high-voltage electric current within a treating head, which is applied to a substrate by means of pressurized air. PlasmaDyne Pro’s plasma process improves the surface tension on polymers, rubber, metal, glass, ceramic, paperboard and composites. Kiel added that “it is adaptable to countless applications.” Power/treatment levels can be adjusted for each application. The treating heads produce a discharge area of 10-40mm in width, depending on the type of treating head recommended for the application. The first customers to receive the PlasmaDyne Pro have been happy with the system’s performance. “Customers have come to appreciate 3DT’s classic PlasmaDyne for its dependability and durability,” Kiel said. “In fact, there are numerous systems in the field with more than 25,000 hours of operation, and they still are running strong.” He concluded that when considering the improvements made to this system, 3DT anticipates customers will experience the same long-lasting, high performance with the new PlasmaDyne Pro.